And we can’t forget my secret ingredient: Bragg Liquid Aminos. This stuff is so good. I put it on everything. Well, not really. But I would if I could. I love it that much. Once you get all the ingredients for your gluten-free sesame seed kale salad recipe together, get a large bowl and put the kale salad in first and then add all the ingredients. Shake it up and store in the fridge for 30 minutes to 1 hour before serving. This naturally gluten-free kale salad with sesame seeds recipe is easy to make and takes minimal effort. If you are looking for a gluten-free kale salad with more protein or substance, add chicken breast to it or cut up an avocado and throw it in the mix. Be creative. It will taste great and you who knows – you may even love it so much that you eat it for dinner three nights in a row like I did! 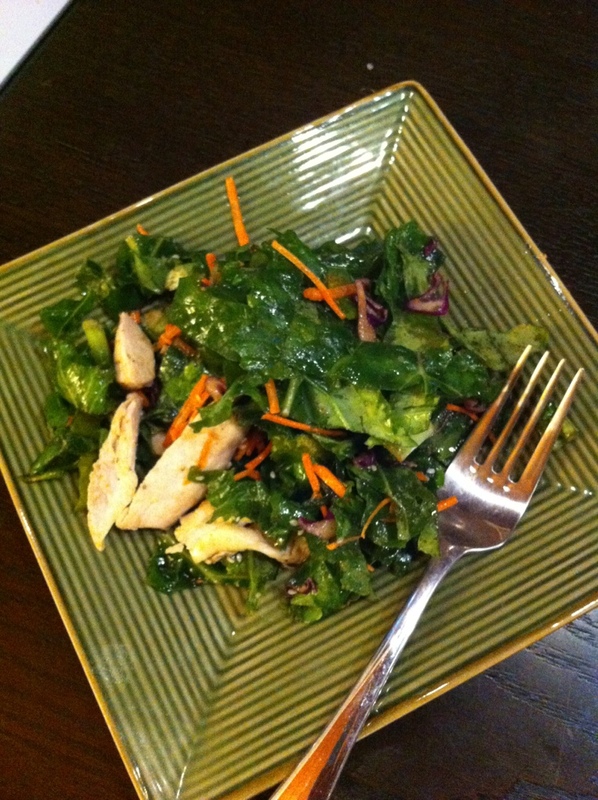 I really love this gluten-free sesame seed kale salad recipe. It’s become a regular in our dinner rotation and I hope it is something you and your family can enjoy, too! It is healthy, gluten-free, and tastes great! KALE IS AMAZING. Have you made kale chips yet? I have! They are so yummy! What do you put on yours? This sounds great! How much of the Bragg’s liquid Amino do you use? Not too much, just a couple squirts of it. If you use too much the kale will get soggy.